Robert Don was a successful Wine & Spirit Merchant, as indicated by his employment of four domestic servants- John Hendry 17, John Ogilvy 19, Isabella Taylor 19,and Sylvia Shepherd 14. There is no evidence of involvement in trade or public affairs. 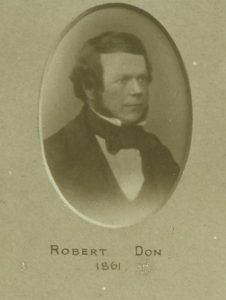 Robert Don set up his long standing business as a wholesale spirit, wine and tea merchant at 41 Nethergate, Dundee in 1846. His business continued to operate for many years at the same address. Robert Don made a successful career in his business as a wine and spirit merchant. His series of home addresses – 39 Albert Court(1846), 11 Thomson Street(1850), Seafield Road(1856-8), Magdalen Yard(1859-60) , 43 Union Street, culminating in Gowrie Cottage(1862-1894) were indicators of his success. He ceased to trade in 1869 although he continued to own property in the Nethergate. My thanks to the Library Staff in the Local History Dept Central Library Dundee. The information above about Robert Don has been collated from a range of digital and hard copy sources. To the best of our knowledge it is correct but if you are relying on any information from our website for the purpose of your own research we would advise you to follow up the sources to your own satisfaction. If you are aware of an inaccuracy in our text please do not hesitate to notify us through our Contact page.